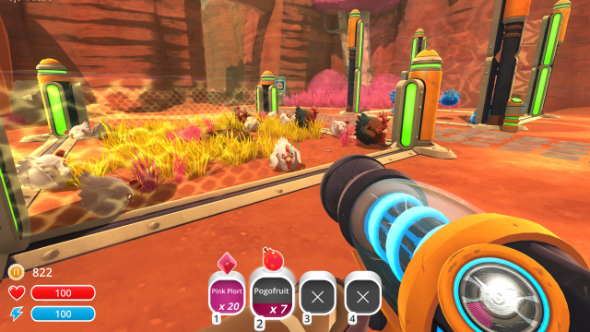 Slime Rancher is a strange and beautiful game about selling poop, more or less. It presents screens full of smiling, gently bobbing globules – which you can bend to your will using an immensely satisfying vacuum gun – and lets you farm them for profit. Put said globules in pens, feed them things and harvest their droppings, then laugh all the way to the bank. As business plans go, it’s right up there. Slime Rancher not REAL enough for you? Check out the best PC simulators. But something strange happened to me out on my own Slime ranch. My newfound profession started to weigh heavy on my conscience, and before I really processed what I was feeling, I’d become the kind of self-satisfied, pseudo-spiritual farmer whom Hugh Fearnley-Whittingstall might visit on a Sunday evening TV show. To put it less facetiously, I decided to run a free range vegan Slime farm which put the welfare of my livestock above profit or, if I’m being honest, practicality. Approaching the game in this new and entirely undirected way presented all kinds of interesting wrinkles and hurdles which only reinforced the validity of the whole endeavour. I’ll add a big neon flashy disclaimer here that this isn’t a preachy exercise in pushing either side of the veganism argument. It’s simply a journey of discovery to see how much Slime Rancher will accommodate me playing it in a different way than intended. Ok? Ok.
A ranch full of slime! Whoever heard of such a thing. No matter, I’ll head out and collect a few samples to start the ball rolling. 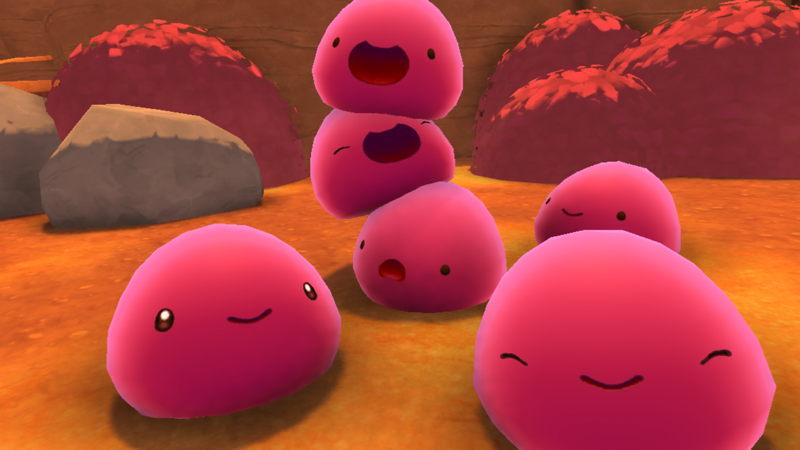 Crikey, there are a lot of Pink Slimes out here. I hoover up 20 of them and fondly imagine them to be the backbone of my ranch. My proud blancmange workforce. Among them are some rather aggressive Rock Slimes, and some Tabby Slimes too, who are just adorable. In the VacPack they go. I set up three corrals back at base and spit my captives out into them. Unsure what to do next, I stand and watch them bouncing on each other impassively for a bit in their new homes, then I go to bed at 7PM. Curses. I didn’t make any money yesterday, did I. I’m going to have to work this farm harder if it’s going to work out here on this strange new planet. You hear that, everyone? We’ll all have to pull our weight here from now on. No more bouncing impassively. Unless… that generates money somehow? I check the game’s encyclopaedia – it doesn’t. Definitely no more of that then. I go out and forage for food, making note of each Slime type’s culinary preference. Rock Slimes like veggies – there are carrots all over the place so that’s easy. Pink Slimes eat anything, so they can have the carrots too. 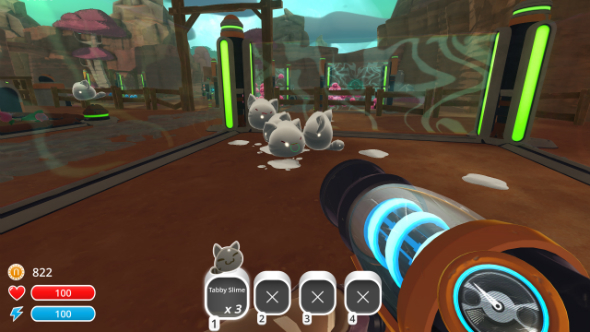 Tabby Slimes, however, are carnivorous and require me to gather some Hen Hens from the local wilds in order to feed them. I feel a bit conflicted hoovering up reluctant avians into this VacPack. The Slimes seem to quite enjoy it, but the Hen Hens’ indignant clucks play over and over in my mind afterwards. Still, Tabby Slimes have extremely valuable Plort, and selling Plort is literally the point of the game. Also Plort is basically feces so let’s continue calling it Plort. Back at the ranch I fire a few carrots into the corrals for my Pink and Rock Slimes, and head over to the Tabby enclosure to feed them some Hen Hens. Some wide-eyed, innocent Hen Hens. I’ll just pop them in the corral and it’ll all be over. In a minute, I mean. I’ll do it in a minute. I just need to… my goodness, 7PM already? Straight to bed for me, no time for any more farming tonight! Rest ye well, Ranch of Slime. Until the morrow. It’s no good just feeding these Hen Hens to the Tabby Slimes and then having to go out and find more every day. That’s just not sustainable farming – I need to keep them in a chicken coop instead, with a Rooster, so they can provide a constant source of sustenance for my livestock. I do that, privately relieved that I’ve bought them all some more time. There’s a rooster not far from my farm, whom I duly vacuum up and pop into the coop with them. Over by the Rock Slimes and Pinks I install lovely gardens growing carrots and Pogo Fruits. 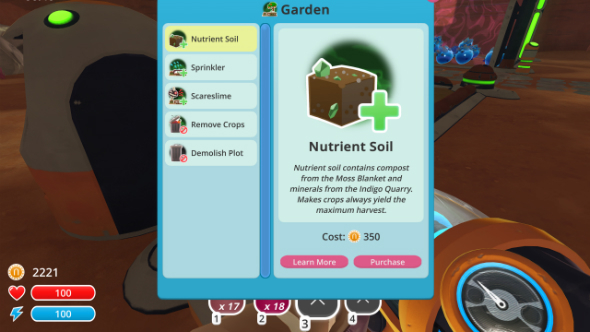 Rock Slime Plort is selling at a real premium now, so I ‘harvest’ it all up from the pen and sell it. And that’s another day’s successful farming in the books. 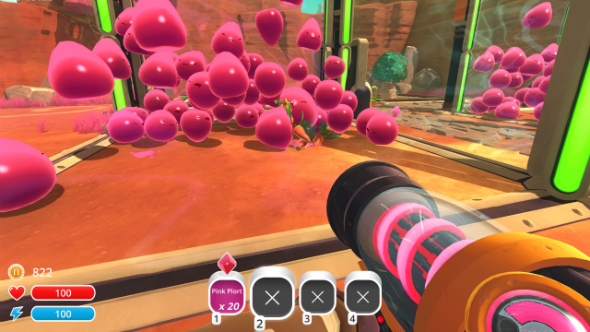 I’m not sure what happened overnight, but the Pink Slimes are everywhere and they’ve demolished both my gardens. Gathering them all and spitting them out into their pens again, I realise that conditions are so overcrowded in there that they’re able to climb on top of each other and jump clear of the walls. I’m angry about the carrots and Pogo Fruits, yes, but I feel for the little guys crammed in there. The Tabbies still haven’t been fed, even though there’s something of a thriving chicken community developing at the other end of my farm. 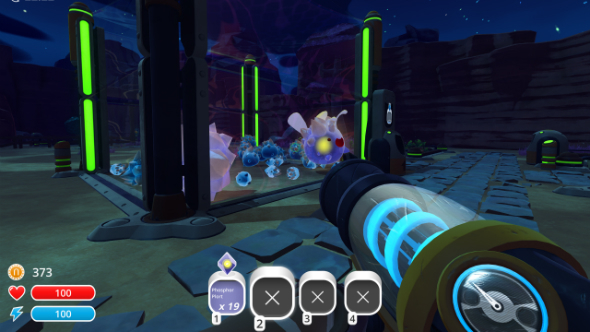 Ignoring that issue completely, I invest in taller walls and Plort collectors for my corrals using the meagre profits my Pink Slimes yield. It’s at this point that I make the call: I’m going free range, vegan farming or bust. 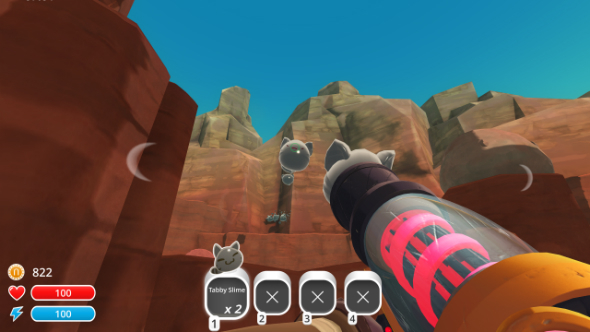 The real world is full of shades of grey, conflicting arguments and infinite complexity, but here in Slime Rancher things are so brutally clear-cut that throwing a Hen Hen into an enclosure of hungry Tabbies seems simply monstrous. There, I said it. Having invested considerable Newbucks into my current setup – two overcrowded Pink Slime corrals, one for Rock Slimes and one for Tabbies, with a chicken coop and three gardens – I decide the ethical thing to do is to basically start from scratch. The chickens are the first to go. I pop them out as lovingly and ethically as I can back into the wild, resolutely not watching the nearby Slime population zero in on them to almost certainly devour them within seconds. Anyway, it doesn’t matter: if that happens, it’s nature deciding things, not me. Then the Tabbies are ejected back into the wilderness, just a bit past the area where I left the chickens that aren’t here anymore, but as I’ve mentioned that’s absolutely fine and doesn’t highlight the futility of my endeavour in the slightest. It doesn’t feel tremendously ethical to use a vacuum gun and fire my once-captive beings out at some speed, but it’s the best I can do. I go to bed late (10PM) having made precious little money and recruited a few Phosphor Slimes to replace the Tabbies. Or day one, as I like to think of it, on my new environmentally-responsible ranch. No emails from Aldi yet asking to feature me in one of their adverts, but it’s early days and with being out here on this distant planet I don’t tick that ‘locally sourced’ box the big supermarkets like to pair with ‘ethically reared’ in their marketing. It’s still relatively easy to make money on the farm, although my livestock is still confined within roofed enclosures and that jars a bit with the utopian image I’m going for. I strike it lucky by finding some Heart Beet in a box, and since it’s my Rock Slimes’ favourite food I devote two gardens to its production. Over on the other side of my farm are two Cuberry gardens – loved by Pink Slimes and Phosphors alike. My Plort collectors are doing their jobs, and I’m still turning a tidy profit. Uh oh. Things have taken a turn for the worse on Smile Ranch (a delightful anagram of ‘slime ranch’ that I’m particularly pleased with). Overnight, the bottom has completely fallen out of the Rock Plort and Phosphor Plort markets, rendering my speciality livestock’s droppings only slightly more valuable than the abundant Pink Slimes. It’s especially wonderful that the game can throw curveballs like this, but especially unhelpful for the farmer who cares about making the world a better place. This is really a big setback to my plans for making the ranch free range. There are only so many mornings I can wake up to see those two beastly corrals of Pink Slimes, my once proud magenta soldiers stacked three deep and inevitably spilling into the surrounding area. Ranch expansions are expensive though, and letting the three breeds interact can only spell disaster: when a Largo (cross-breed) eats the Plort of a Slime it isn’t a cross-breed of, it becomes a Tarr. The Tarr are terrible, awful things who consume all who lay in their path – the antithesis of veganism, and to be avoided on my ranch at all costs. So I’m at a bit of an impasse. My Plort yield isn’t going to allow me those expansions any time soon, and all the while my livestock suffers. You’re telling me pimping ain’t easy, Big Daddy Kane? You want to try responsible Slime farming, mate. To be honest, this entire period has been a pretty miserable slog in which I do nothing but feed fruits and vegetables to the respective Slimes, collect their Plort and feed it into a dispenser for Newbucks. To make matters worse, some of the Pink Slimes get at my Heart Beet patches and decimate them. With Heart Beet being so rare, I have to trade certain items with other Ranchers on the trade machine to get more Beets to plant. It’s a trade that might involve several Hen Hens, two Roosters, and two Rock Hens. I don’t know what my trader wants to do with these birds when she receives them, and I don’t ask. Sometimes, if you want to avoid making an omelette, you have to break a few eggs. Pretty sure that’s it. Finally I have the funds to expand my ranch and allow Phosphors to roam wild in their dank little cave (don’t worry, they love it in there) while the Rock Slimes frolic in the wilderness and Pink Slimes run amok in my original location. They’re all fed locally-sourced fruit and vegetables daily, and they live a good life. My life, by contrast, is absolutely horrible. In the absence of any feeding or Plort collecting devices within a corral, I have to do everything manually, which takes absolutely ages. Compounding that misery is the fact that everything’s so spread out now that walking to the dispenser and cashing in my Plort is a considerable schlep. It’s a terrible, terrible way to turn a profit, much less progress through the game. But the Slimes on Smile Ranch thank me for it every day. I imagine. I mean, mostly they just bounce impassively.